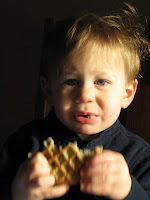 Vance loves Eggo brand Nutra-Grain blueberry waffles. And now there's a shortage. There's notes on freezer doors of grocery stores (I've tried 3 different ones) stating the issue and promises of getting them back as soon as possible. I have tried a different brand (Kashi) but it brought it him to tears. Breakfast has been difficult for the past two weeks. Let's hope the folks at Kelloggs resolve this issue soon. Those pictures are really cute. Hopefully you will get those waffles. If they ran out of veggie sausages from Morning Star our mornings would be a disaster. I have had the same problem! Too funny!